Olight was established in 2006 as a manufacturer of high quality illumination tools. After breaking out in the outdoor and flashlight enthusiast markets in Europe, Olight turned its focus on to the tactical market and began designing products tailored to meet the needs of law enforcement and government agencies. Their M series lights pushed the envelope of light output, features, and durability, solidifying their reputation and position in the marketplace. Not content to rest on their laurels, they continued to innovate with their powerful SR line of searchlights, the super compact S Baton series, and the X6 Marauder. Their product line has expanded to include models powered by CR123A lithium batteries, standard AAA and AA alkaline batteries, and convenient rechargeable battery packs. They continue to deliver cutting-edge products and are committed to keeping Olight a forerunner in the illumination tool market — providing products that are accessible to everyone. They believe that, with our support, their future will be brighter than ever. 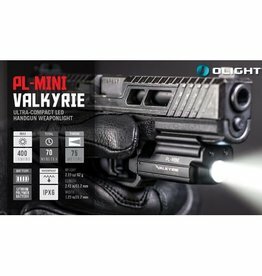 De Olight PL-1 II VALKYRIE wapenlamp met 450 lumen. 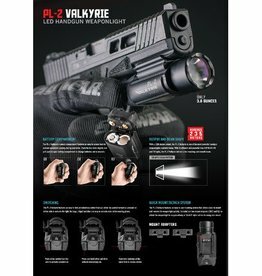 De PL-MINI Valkyrie is 's werelds krachtigste compacte wapenlamp met een maximale output van 400 lumen met behulp van een ingebouwde CREE XP-L HI LED. De PL-2 Valkyrie Desert is een zeer krachtige zelfverdedigingstool die een agressor in directe omgeving binnenshuis verblindt.